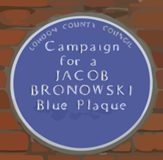 Gower Street is a street in Bloomsbury, Central London on which can be found several sites of humanist heritage. In the middle is University College London, founded in 1826 on secular, inclusive principles. At 110 Gower Street (previously 12 Upper Gower Street) Charles Darwin lived and worked 1838-1841. At 1 Gower Street are the current offices of the British Humanist Association and the Rationalist Press Association. Gower Street is a public street.